Many awesome games never make it across the water to the United States, despite being in print for many years in Germany. 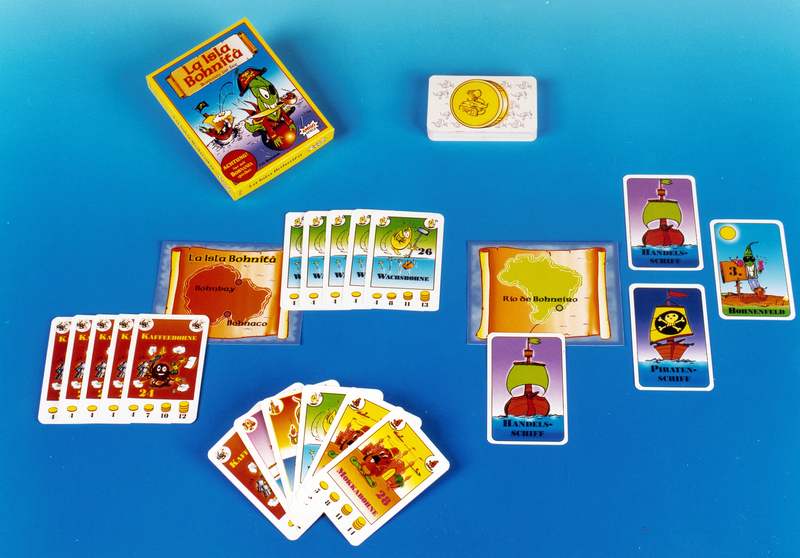 Among those classic, well-loved games is the Bohnanza series of card games by Amigo Spiel. 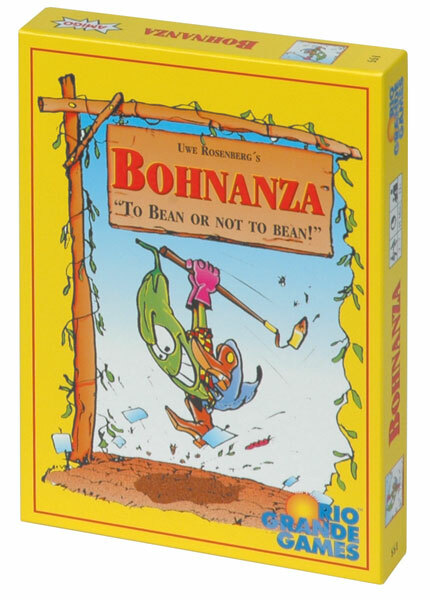 Although the ever-popular game of bean planting, Bohnanza by Uwe Rosenberg, did make it to the U.S., thanks to Rio Grande Games, only two of its numerous expansions have ever found an American publisher, those being High Bohn Plus and Bohnaparte. If you love Bohnanza, you need to check out the long in-print German expansions, La Isla Bohnitâ and Bohnröschen. La Isla Bohnitâ adds merchant ships, an island and pirate ships to Bohnanza. All players begin the game with a merchant ship onto which you can load a bean harvest, and sail to one of the ports on La Isla Bohnitâ to acquire additional beans for free before selling your harvest. You can buy additional merchant ships as well as a pirate ship. Arrr! With the pirate ship you can plunder beans from your fellow players’ merchant ships and make off with the dole. 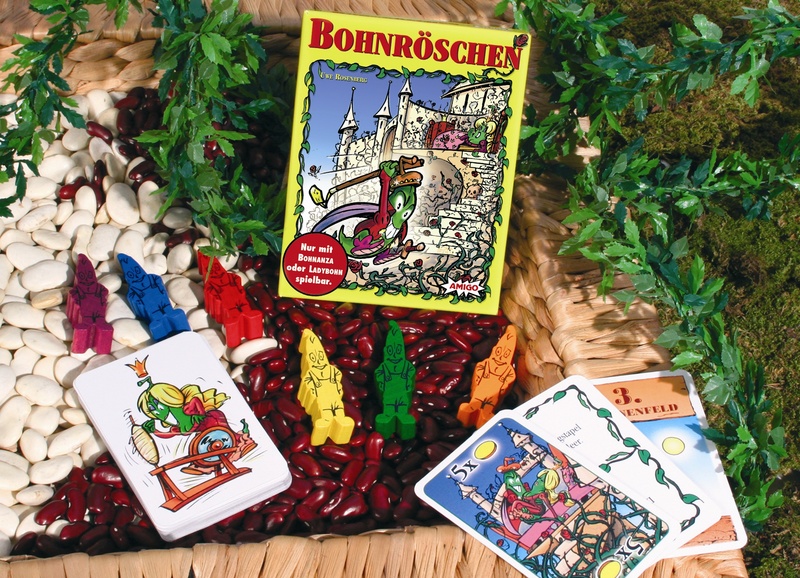 Bohnröschen, which translates as “Briar Bean” – think Briar Rose of Sleeping Beauty – brings Bean Meeples (Princes) to the Bohnanza universe. It changes the ending conditions of the game. Instead of playing through the deck 3 times, players must complete a series of quests to hack their way through the brambles to Sleeping Beauty. The first to reach her, with at least 5 gold coins (apparently she’s not interested in paupers) ends the game by waking Briar Bean with a kiss. She crowns the bean prince with the most gold as the winner. Quests include things like “Sell a crop for exactly 3 or 4 gold”,”Have Soy Beans in one of your fields”, “Plant 2 identical beans in Phase 1”, etc. 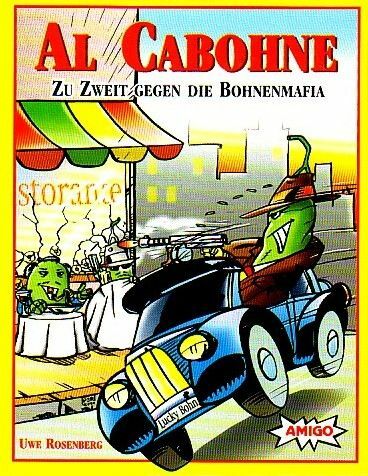 The Bohnanza family also includes two noteworthy stand-alone games: the one- to two-player Al Cabohne in which players play against the Bean Mob and Ladybohn: Manche mogen’s heiss! (Lady bean: Some Like It Hot!) which brings lady beans and baby beans to the mix. 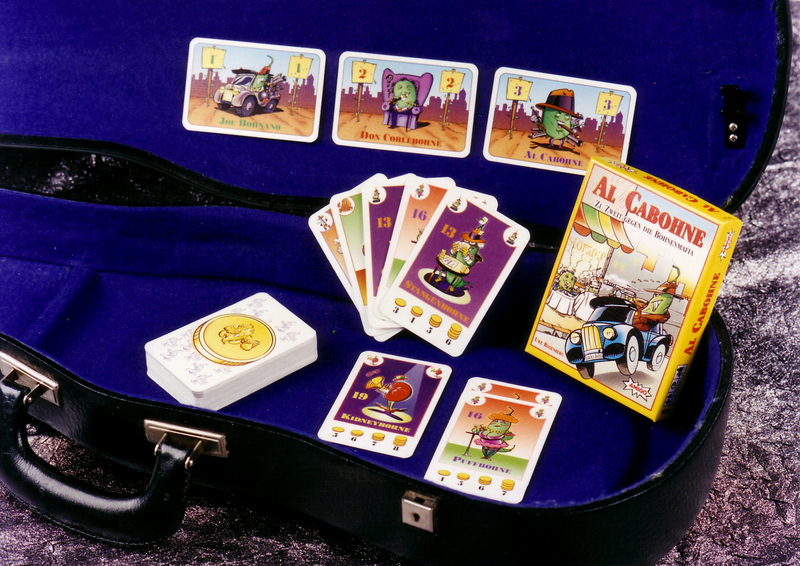 Al Cabohne is a variant of Bohnanza for one or two players. Players compete against each other and the Bean Mafia: Don Corlebohne and Al Cabohne in a two-player game, as well as, Joe Bohnano in a solo game. Whoever makes the most profit selling beans wins the game (whether a player or the mafia). I can tell you from experience, that if you don’t cooperate at least some with your opponent, the mob will win every time. The bean mafia demands protection money (beans) whenever you grow the same variety of beans as them. 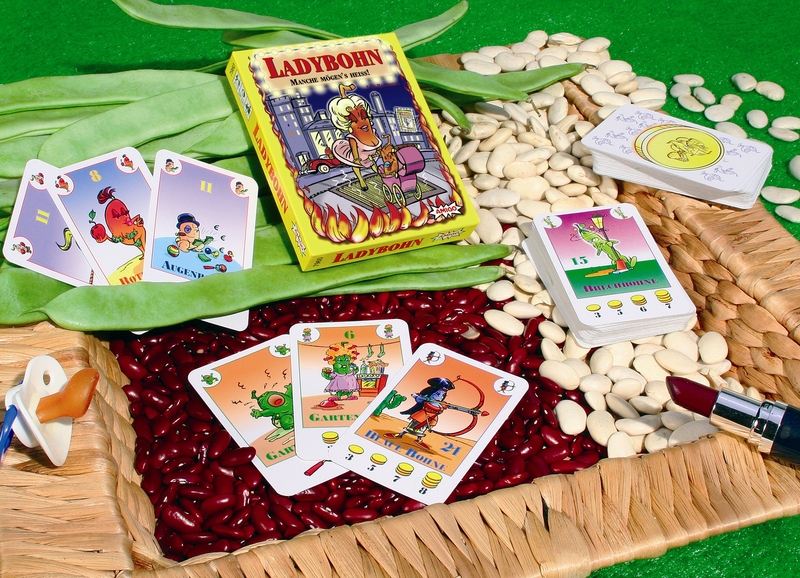 Another interesting feature of Al Cabohne is the three new bean varieties: Stangenbohne (Runner Bean), Puffbohne (Broad Bean), and Kidneybohne (Kidney Bean). These new beans have beanometers that do not conform to the usual beanometer patterns found in regular Bohnanza. The beanometers of the lady beans and baby beans in Ladybohn: Manche mogen’s heiss! also follow a different pattern. Lady beans have a much better beanometer, but it only applies when a lady bean is on top. Baby beans have a zero beanometer, making your field worth nothing if you harvest it while a baby is on top. However, when you plant a baby bean in a field, you can move a Lady Bean one or two places up in that field. Baby beans also count towards the total number of beans when harvesting. All of these Bohnanza card games and expansions are great family games that are light, easy to learn, easy to teach, and play in a relatively short time. When you buy them from Here Be Books & Games, you’ll even get an English translation of the rules. 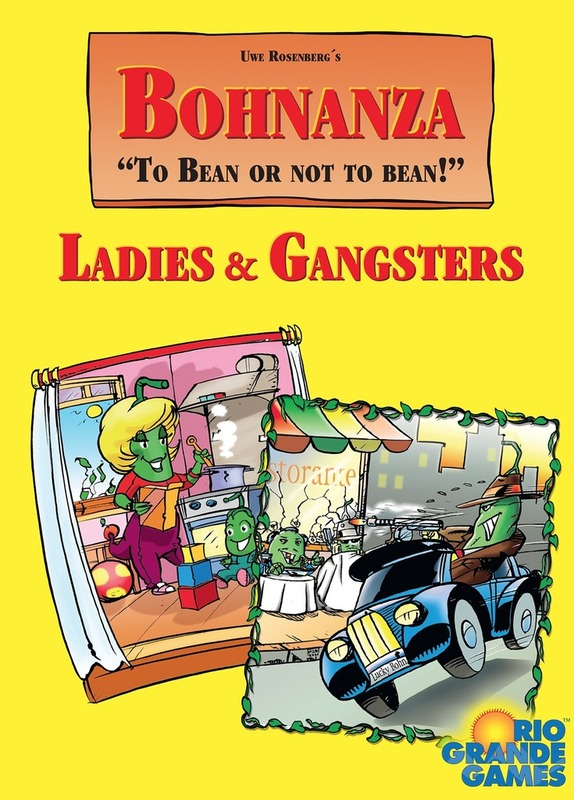 Rio Grande Games just released two new Bohnanza games: Bohnanza: Princes & Pirates Expansion and Bohnanza: Ladies and Gangsters. 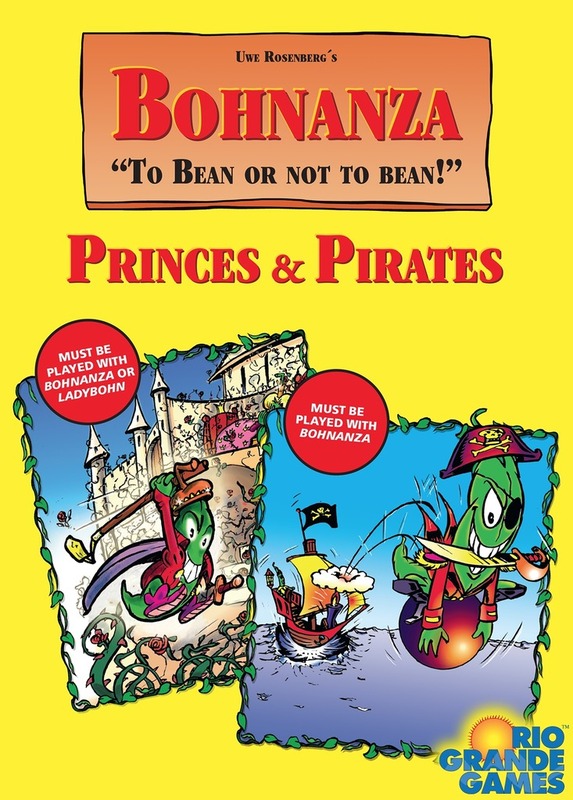 Bohnanza: Princes & Pirates Expansion is a combination of Bohnröschen and La Isla Bohnitâ, while the stand-alone Bohnanza: Ladies & Gangsters game includes Ladybohn: Manche mogen’s heiss! and Al Cabohne. Drop by Here Be Books & Games. We’ll teach you how to play any and all of these Bohnanza games and expansions! Is there any possible way you could do a run-through of the Bohnanza Pirates expansion? I’m rather lost, I’ve read the instructions several times and I’m just not getting how the interaction between the ships and islands work. Specifically, how do beans go from your fields to ships to islands to being “coined” … please help! Thanks for the request. I just published a run-through of Bohnanza: Pirates for you. Hope this will help!